A recent report released by the National Renewable Energy Laboratory demonstrates just how much the 18,000-plus students who have participated in the U.S. Solar Decathlon may have influenced the market adoption of some once-futuristic technologies that are now readily present in our homes. The report, titled Insights on Technology Innovation – A Review of the U.S. Department of Energy Solar Decathlon Competition Entries 2002–2015, focuses on several technologies, including solar photovoltaic (PV) technologies, innovative materials, construction techniques, efficiency strategies, and building-integrated vegetation. While solar is the most visible star of the Decathlon, the efficient technologies that reduce a home’s energy demand set the stage for reaching a net-zero energy status. That kind of energy savings is critically linked to the successful adoption and execution of solar electric systems, as homes that require less energy also require fewer solar panels and lower costs for consumers. The NREL report offers the use of smart home technologies as one example of technology early adoption and demonstration by Solar Decathlon teams. Smart home systems, especially those that give consumers greater control over when, how much, and for what purpose their household requires electricity, allow both consumers and electricity providers an opportunity to optimize electricity use with the time of day when solar electricity production is highest, and vice versa. According to recent reports by CNBC and Business Insider, smart home technologies are really only likely to take off in the consumer market beginning this year, whereas NREL reports that multiple Solar Decathlon teams were showcasing some form of residential control technologies as early as 12 years ago. In 2007, “at least two team houses featured touch-screen controls that interfaced with the Internet.” In 2009, “at least seven teams were demonstrating integrated graphical displays and experimenting with responsive control algorithms and remote access.” Then in 2011, one team “programmed their house to respond to hand movements and signals by modifying a Microsoft Kinect attached to an Xbox.” That’s the same year Apple released the iPad on which I am typing this blog post, and six years before Google acquired NEST smart thermostats! 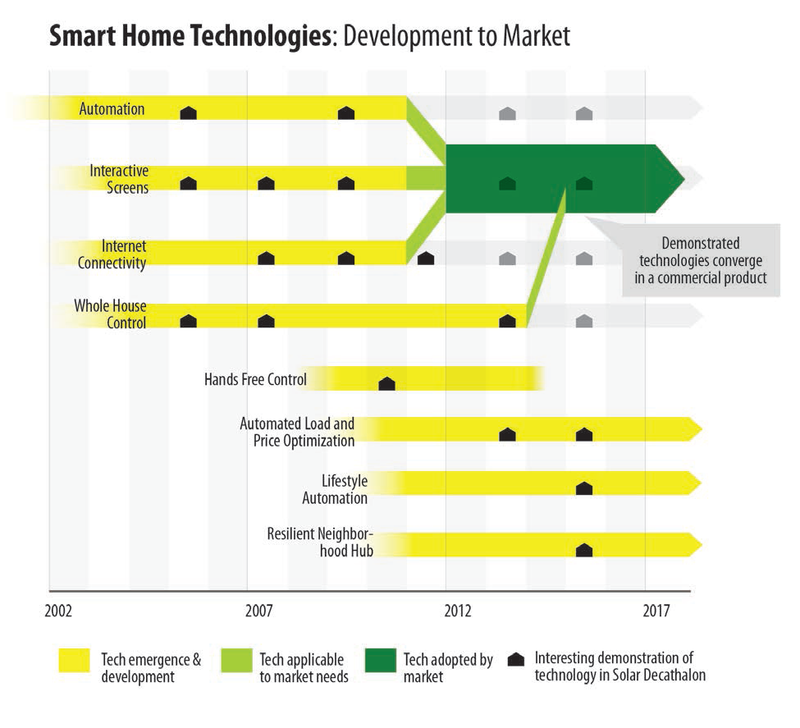 The report goes on to provide examples of more innovation in smart home technologies in the 2013 and 2015 competitions that reflect trends we’re seeing in the consumer market more recently. These systems did more than just optimize heating and cooling in accordance with the weather, but also allowed occupants to operate lights and appliances, assisted with home gardening, and supported a house in performing as an essential neighborhood energy hub in the event of a disaster. Solar Decathlon team use of LED lighting provides another stunning example of technology early adoption and demonstration. According to the NREL report, LED lighting “represents the fastest growing, most common new lighting source for residential” applications. And, that’s a good thing, as the U.S. Department of Energy (DOE) estimates LEDs use 75% less energy and last 25 times longer than incandescent bulbs. According to the National Electrical Manufacturers Association “A-line LED lamps” (that’s LED light bulbs to the rest of us) currently account for 32% of the consumer market. Compare that to NEMA’s estimate for LEDs just five years ago in 2012—0%. I’d call that a fast-growing trend! What does the Solar Decathlon have to do with this? It’s impossible to draw a straight line from the Solar Decathlon to such significant market growth, but Solar Decathletes were certainly important early adopters who worked with industry partners to develop the technology. The NREL report notes that in 2005, LEDs were not really being considered for the residential market and that “compact fluorescent (CFL) bulbs were going to change the world, but Solar Decathlon teams thought differently.” Four teams in 2005 experimented with LED lighting in novel ways. 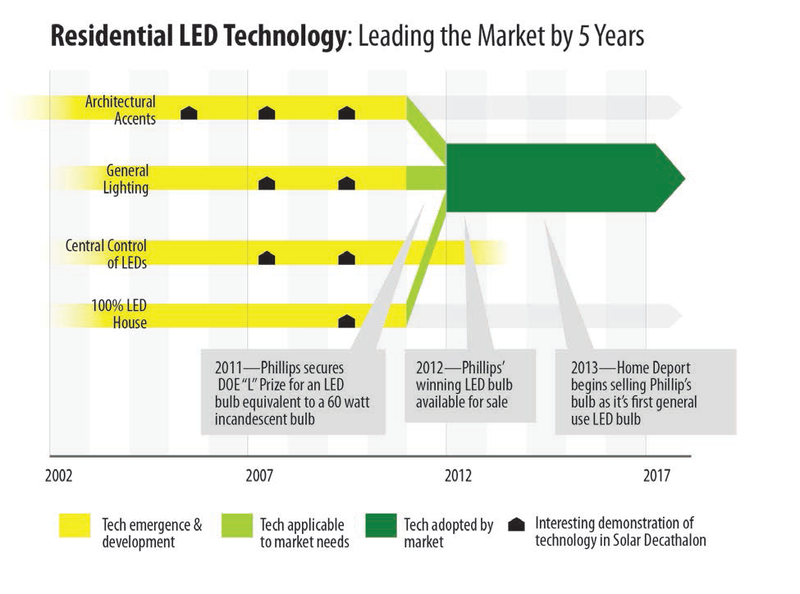 In 2007, teams began to use LEDs as “functional general-purpose lighting, replacing fluorescent and incandescent bulbs.” In 2009, 100% of teams used LED lighting in some way, and five teams are discussed as “already demonstrating 100% LED solutions in their houses.” Contrast this timeline with DOE’s announcement of the L Prize as part of the 2007 Energy Independence Security Act “to develop super high-performance, energy-saving replacements for conventional light bulbs that will save American consumers and businesses money.” And consider, Phillips did not win the L prize for their LED 60-Watt replacement bulb until 2011. What is the connection between the Solar Decathlon and market transformation and diffusion of new technologies? It’s easy to spot at least three critical links. First, Solar Decathlon, as a workforce development project, has provided tens of thousands of students the opportunity to grapple with potentially transformative technologies, and these students will or have gone on to work in or create the businesses that bring transformative technologies to market. Second, Solar Decathlon teams must fund their own projects. That means they are always looking to industry for assistance. Often, this assistance comes in the form of technology development or demonstration. A team’s experience with a particular product provides critical feedback to the developer and has the potential to influence the way in which the product is ultimately delivered to the market. And last but by no means least, the Solar Decathlon is a huge consumer demonstration event. NREL reports an average of 90,000 visitors attended each of the seven Solar Decathlons held from 2002 to 2015. So, when it comes to a link between the Solar Decathlon and, for example, significant growth in the smart home technology and LED lighting industries—coincidence? Those of us lucky enough to participate in the Solar Decathlon certainly don’t think so. To find out what’s on the horizon, sign up to receive email updates through the Solar Decathlon Village Insider. We’ve got our eyes on future competitions and innovation insights to come! This entry was posted on Monday, October 23rd, 2017 at 1:02 pm and is filed under Competition, Energy Balance, Solar Decathlon, Solar Decathlon 2002, Solar Decathlon 2005, Solar Decathlon 2009, Solar Decathlon 2011, Solar Decathlon 2013, Solar Decathlon 2015, Solar Decathlon 2017.